Fantastic panoramic view from the Spanish castle downto the old town of Hvar, the harbor and the offshore islands, called "Pakleni islands". Due to the catastrophic bus delay (22 hours caused by the mismanagement of Idriva Tours), we lost the first day of sailing in southern Dalmatia and were first embarked in Makarska (instead of Sibenik, or Trogir). The Plejeska Peninsula is famous for its excellent red wines grown here. 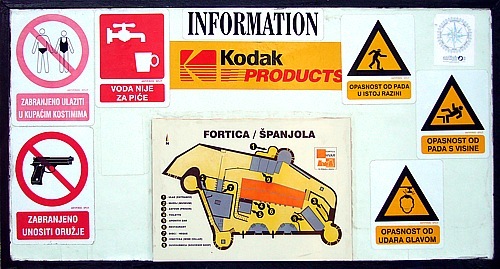 In the west Peljeska is separated by a narrow channel from the island of Korcula. We have a sensational view of the rugged rock landscapes of the peninsula from the highest mountain Sveti Ilija (961 m). On Peljesac the last jackals of Europe are supposed to live. The island of Korcula is known since ancient times as the "Black Island", because of their large pine forests. 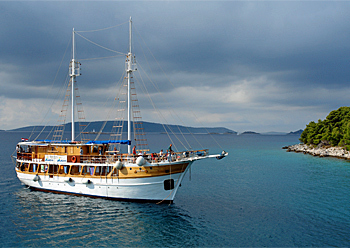 Korcula is the birthplace of the famous explorer and traveler Marco Polo. Because of the fortress walls and towers, well-preserved Korcula is one of the most beautiful towns of Dalmatia. Highlight: 1½ hour walk on the city wall. 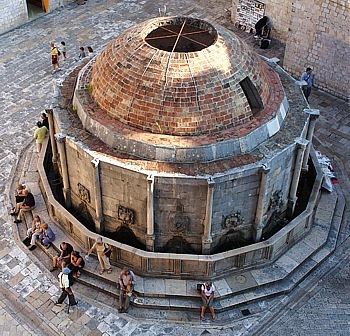 The walk starts from the left side of Onofrio Fountain at the Pile Gate (entryfee 50 Kuna). The Old Town of Dubrovnik is UNESCO World Heritage Site. The city wall consisting of bastions and military towers is 1940 meters long, in some places up to 25 meters high and 6 meters wide. In the city wall steps lead steeply down to a cafe and a swimming area (called Buza) in the rocks. 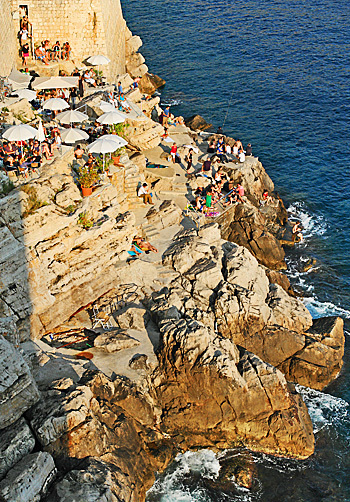 The cafe and the crystal clear waters are especially popular with the youth of Dubrovnik. Beginning of the stairway is the cathedral. The Stradun, Croatia's most famous boulevard is both lively shopping street and evening meeting point (Korzo). The Franciscan Monastery (Franjevacki Samostan) with its beautiful cloister dates back to the 14th century. The museum has a wooden portrait of St. Blasius (14th century). At the cloister is also the oldest pharmacy in Europe, dating back to 1317. Since 1979, Dubrovnik has been a UNESCO World Heritage Site. Tip: Easy hike to the local mountain of Dubrovnik Brdo Srd (412 m, approx 1 ½ hours ascent) with a fantastic panoramic view of the historic city center and the city walls. We start at the Pile Gate through narrow streets in north-west direction. The street Od Kriza leads to an underpass on the main road Jadranska cesta. On the other side begins the trail and leads in serpentine steeply up to the Brdo Srd summit. With the cable car Zicara Dubrovnik Cable Car we float comfortably and knee resting in a few minutes back down to the old town. From Pomena a footpath leads into the National Park Mljet. Two salt water lakes separated by a small bridge are perfect for swimming. In the larger saltwater lake Veliko Jezero is a semi-ruined Benedictine monastery from the 12th Century on the island of St. Mary (Sveta Marija Monastery). 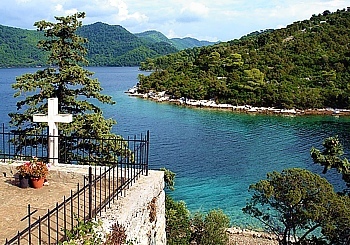 The boat ride to the island is included in the entrance fee to the Mljet National Park. The salt water lakes invite us for swimming. The water temperature is always about 2° C above the temperature of the sea water. We are hiking back to Pomena on the shore of the "Veliko Jezero" under huge shady pines with extremely long needles. Our sailing ship anchors for the night in the picturesque bay of Pomena. Through the strait Splitska Vrata (Split Gate) the sailing ship cruises between the islands of Solta and Brac and continues to Hvar, known for its mild climate and large lavender fields. Lavender as essential oil or as dried flowers in olfactory pillows you can buy in the old town of Hvar on every corner. The smell of lavender in the closet is an excellent protection against moths and other vermin. The climb to the fortress "Spanjola" with fantastic panoramic views down to the old town of Hvar and the offshore islands takes about 20 min. After a swimming stop on the south side of the island Solta we drive through the strait (sound) between the islands Solta and Brac to Milna. 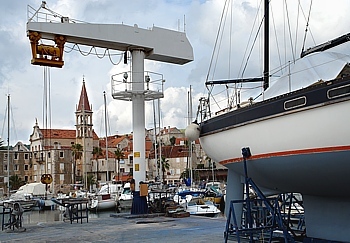 Largest marina in Milna on the island of Brac. Built in the 16th century by the noble Cerinic family, Angliscina Castle is the oldest building in Milna. The Baroque parish church houses a beautiful altarpiece by the Venetian painter Titian. In the harbor area there is an old sardine factory. Zlatni Rat has made the island of Brac world famous near Bol, a headland with a pebbly beach at the foot of Mount Vidova, also known as the "Golden Horn". Already in the third Century BC. Trogir was founded by Greek settlers. A bridge connects the old town of Trogir with the mainland. 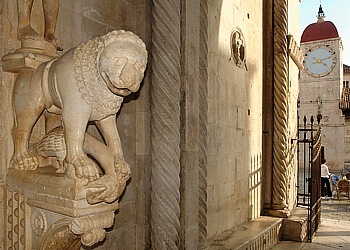 The Land Gate (Kopnena Vrata), a 17th century Gothic archway, is crowned by the statue of St. John of Trogir. A labyrinth of narrow streets with quaint restaurants, art galleries and small souvenir shops awaits visitors within the city walls. Breathtaking views over the city and the harbor you have from the Camerlengo Tower. A Gothic masterpiece is the Cathedral of St. Lawrence (Sveti Lovro) from the 13th to the 16th century. Unusual for this time is the stone carved naked Eva at the portal of the cathedral of Trogir. 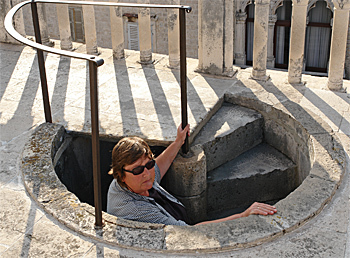 Worthwhile is the view from the belfry of the Cathedral of Trogir despite the arduous ascent. 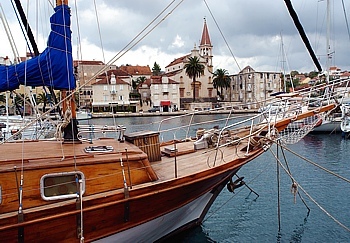 The old town of Trogir - also called museum city - belongs to the UNESCO World Heritage Site.